Though their winemaking days are behind them, their distinctive character lasts on. Decades of careful cultivation combined with the vines natural tendency to create their own whimsical chaos yields striking compositions. With some careful shaping and finishing, each piece becomes a work of art suitable for warming the heart of a true wine lover. 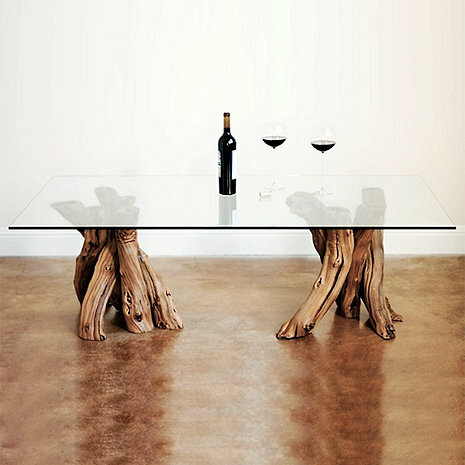 This elegant coffee table is made from some of the oldest vines I have acquired, planted in the 1920's in Napa Valley and were making wine during prohibition. A true part of California history. This item ships directly from the manufacturer via White Glove Delivery. Please allow 4-6 weeks for delivery. Select items will have additional shipping charges, please see above for this item's additional shipping charge. Is it possible to buy a single rather double for smaller coffee table? how do you take care of the base?